Catriona Matthew is only three shots off the lead at the halfway stage in the ANA Inspiration, the opening major of 2016, in California. The 46-year-old followed her opening 68 with a 72 for a four-under-par total to sit joint-14th on a crowded leaderboard at Mission Hills Country Club at Rancho Mirage. Matthew, who has a good record in this event, got to five-under early in her second round then dropped back to two-under before picking up two birdies in the last five holes. American Lexi Thompson (68) and Japan’s Ai Miyazato (70) share the lead on seven-under-par. Former winner Thompson capped off a solid round with a 30-foot birdie putt on the iconic 18th hole at this venue. Miyazato, who held a share of the first-round lead, had an up-and-down day with five birdies and three bogeys in her round of 70. Kiwi world No 1 Lydia Ko (68), Norway’s Suzann Pettersen (67) and Korean In Gee Chun (69) are all a shot back while five players are two shots off the lead in a tie for ninth, including England’s Charley Hull (69). “It’s not as good as the last few weeks, but I still feel like I’m hitting the ball pretty solidly,” said Ko of her game. England’s Jodi Ewart Shadoff (68) is alongside Matthew, but amateur Bronte Law missed the cut along with fellow player Melissa Reid and Northern Ireland’s Stephanie Meadow. 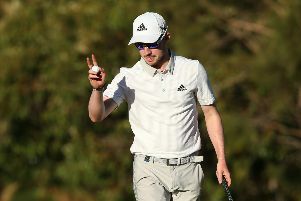 On the PGA Tour, Martin Laird was sitting four shots off the lead with two holes to play when play was suspended in the second round of the Shell Houston Open due to to darkness.